Barely 10 days after two suspected Boko Haram suicide bombers killed at least 13 persons at the northern border town of Fotokol, a second twin suicide attack Wednesday in Maroua, capital of the Far North Region, has left scores dead and dozens injured. Government officials have given varying casualty figures, with the region’s governor announcing a death toll of 17, while a presidential statement placed the figure at 13. Other reports spoke of up to 20 dead. At least 32 other persons were reported injured. Authorities said the first attack took place at the busy Marché Central in Maroua, a city of about half a million inhabitants, while a second bomb went off in the crowded Doualarai neighbourhood. Frightened residents reportedly ran helter-skelter after the explosions rocked the city mid-afternoon on Wednesday and many wailed as military officers and paramedics later pulled corpses from debris and took away the injured from the scenes of the attacks. It is not yet clear whether the government has identified either the suicide attackers or the dead and injured. 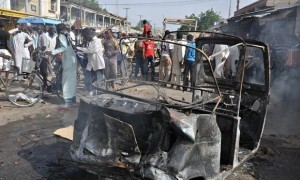 Like in the previous twin suicide attacks on May 13 no group has as yet claimed responsibility, although the mainly Nigeria-based radical group Boko Haram that have been active in northern Cameroon are the main suspects. Boko Haram initially advocated the establishment of an Islamic state in Nigeria, but later expanded its activities to neighbouring countries including Cameroon, Chad and Niger. The group has also pledged allegiance to the extremist Islamic State group that has captured large swathes of territory in war-ravaged Iraq and Syria. Cameroon declared war on Boko Haram in May 2014, with the country’s president ordering the deployment of thousands of special forces in the north of country and the recruitment of thousands more to defeat the militants. While public support for the war remains high, there are whispers of disappointing results. Cameroonian special forces — supported by soldiers from neighbouring Chad since February this year — have killed hundreds of militants in numerous operations. But they have equally suffered significant losses. Attacks by the militants have equally increased, not decreased, since the war on Boko Haram was launched with hundreds of civilians, killed, injured or abducted. More than one year since Cameroon’s President Paul Biya vowed to weed out the militants from his country, there is still no apparent end in sight for the war.